Taking a break! Interested in crewing? Feel free to get in touch for next season! Much to my dismay, we had to leave Kyle, veteran of 5 months and thus current holder of the long-termist title, behind in Ceará; he wasn’t quite done with Brazil. There was also talk of an expedition to Machu Picchu with Arne the cyclist. We can’t all be playboys, as my friend James G would say. Leaving the promised land proved very hard for other reasons, too. For it’s not just the Brazilian joie de vivre, their pleasant tropical hedonist culture, or this country’s delightful locals’ open and friendly manner. 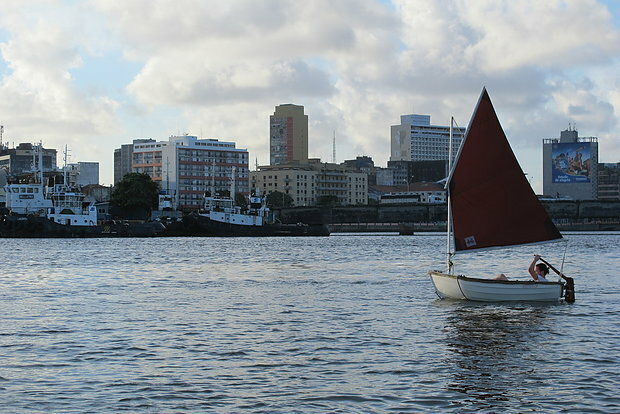 We persevered in lovely Natal for a fair few weeks, once again at anchor up a mangrove-lined river. Arne trundled in by bicycle and joined us for some of it. The fortunate occurrence of the launch party for a silly-looking TV series (“Flor do Caribe”) in the marina on our very first night got us litres of free bubbly, as well as getting us in touch with a few pleasing locals, who were by all accounts also just gatecrashing this weird event. We spent a few relaxing weeks in Cabo Verde licking our wounds and enjoying the exotic weirdness of what was once essentially a slave-trading post, and eventually our one month head start on the Brazilian Carneval had melted down to a mere 16 days. I picked up two German cyclists, Arne and Jo [their blog, German], mainly to make our watches more comfortable, since the charming Cecilie had decided to take the sensible route to Brazil (by airplane). “Wir sind Menschen. Wir machen Götter und kämpfen mit ihnen und sie segnen uns. The year’s winter break consisted of a couple of weeks on the hard in little Gran Tarajal, and two months afloat in the marina, working and preparing for the mildly daunting venture of moving my home to a new continent and hemisphere. An affordable gym, a billiard bar full of Columbians, and pleasing encounters with fellow boatists rounded off this well-deserved break from my usual nomadic modus operandi. I revived the outboard I had sunk with Richard off Papagaios beach that summer with Bob and the legendary Crazy Pete, notorious for spending weeks in the rolly anchorage outside port. I’m sure rumours that he had sold his passport in Morocco are entirely unfounded. I had set out on a trip around the Canaries on a bit of a magic roundabout. Going round in circles seems to be more of a day sailor’s outing, and I hadn’t really done any courses with an N for North in it since Belgium. But this was to be my holiday, the culmination of two years of fixing the boat in exotic locations, which some regard to be the essence of cruising a sailing vessel, and partying my not particularly godfearing backside off all over Europe. Official tour video – thanks Arron!